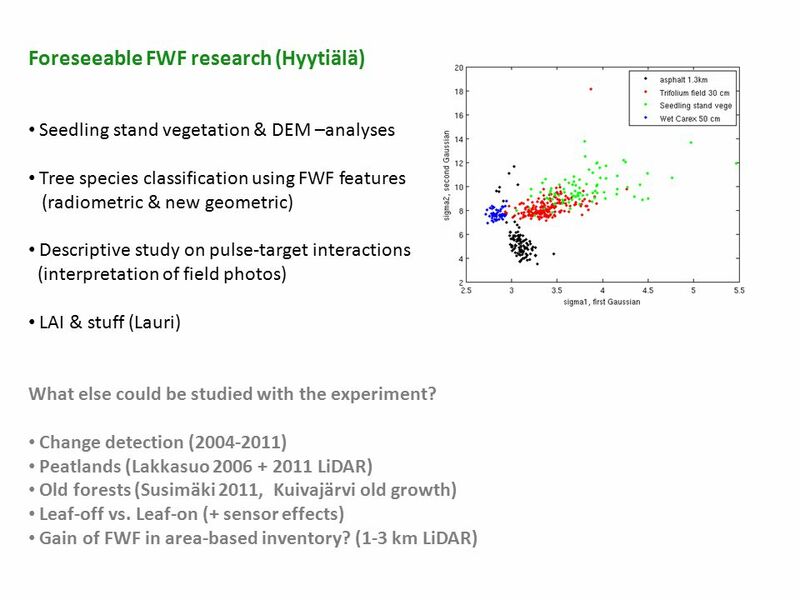 UEF Traditional Christmas Seminar on Forest Inventory Full-waveform LiDAR research at the Hyytiälä site Ilkka Korpela, Docent Outline What is FWF LiDAR. 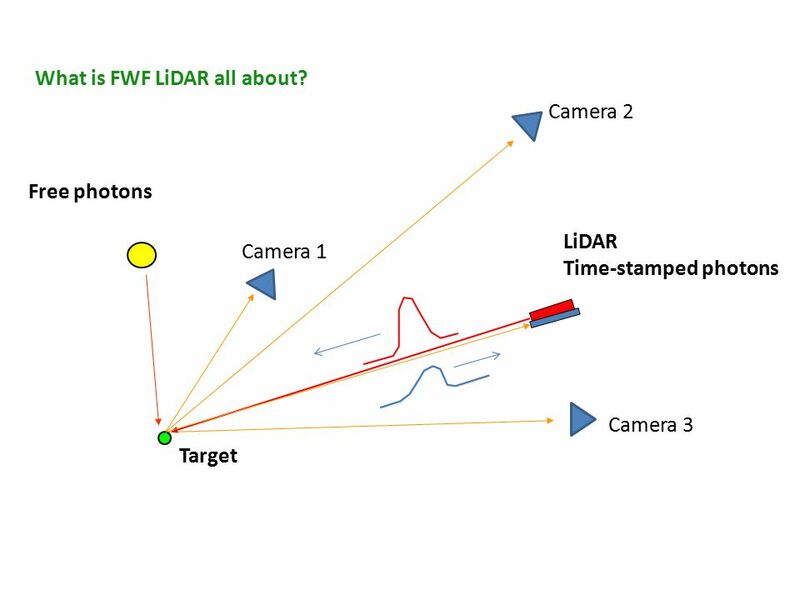 2 LiDAR Time-stamped photons Camera 1 Target Free photons Camera 2 Camera 3 What is FWF LiDAR all about? 3 Ilkka Korpela t0t0 P TX Time TX: Pulse, 4  10 ns (1.2  3 m), e.g. 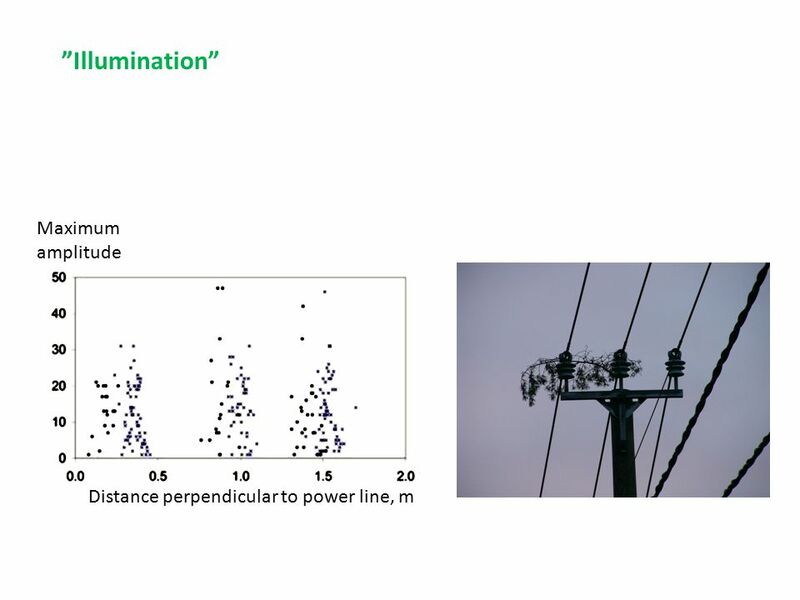 1064 nm (NIR), 0.15  1 mrad (15  100 cm/km) RX: Optics & Photondetector & Amplifier & ”Fast correlator” System: Time, Position, Attitude of equipment & mirror [X, Y, Z] (t) + et L × R(rX, rY, rZ)(t) × [sin(  L )cos(  L ), sin(  L )sin(  L ),cos(  L )] Illuminated area Divergence, e.g. 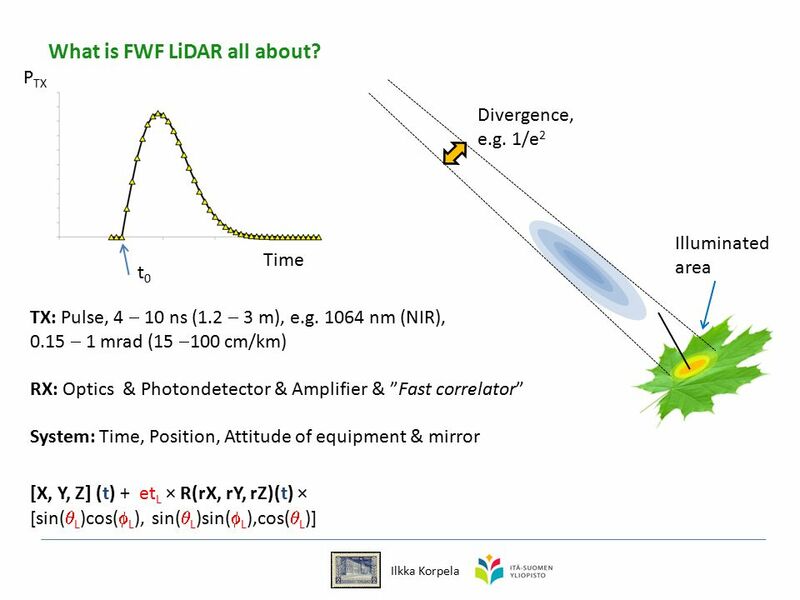 1/e 2 What is FWF LiDAR all about? 4 Ilkka Korpela Transmitted pulse (t) Sum wave thru the receiver optics (t) Inherent noise ”smuggles” Sum-wave: front, maxima, back edge.  Unambiguous distance? 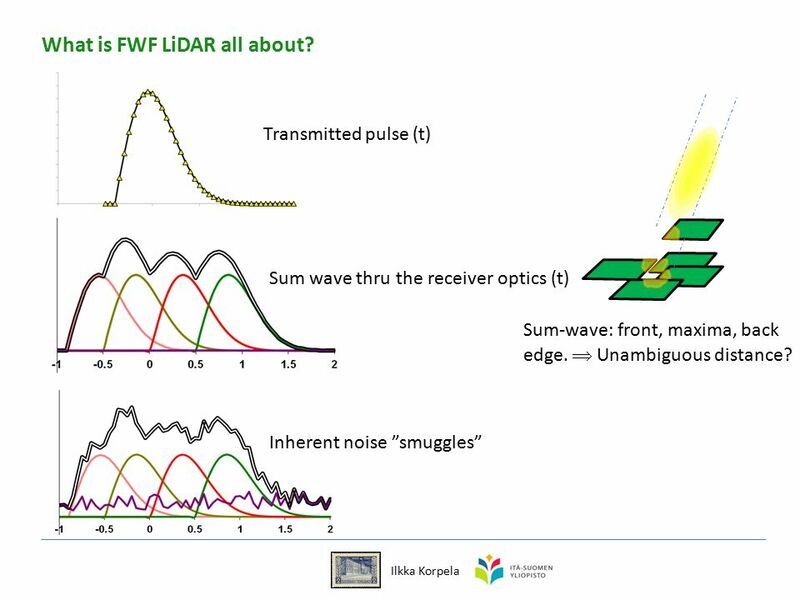 What is FWF LiDAR all about? 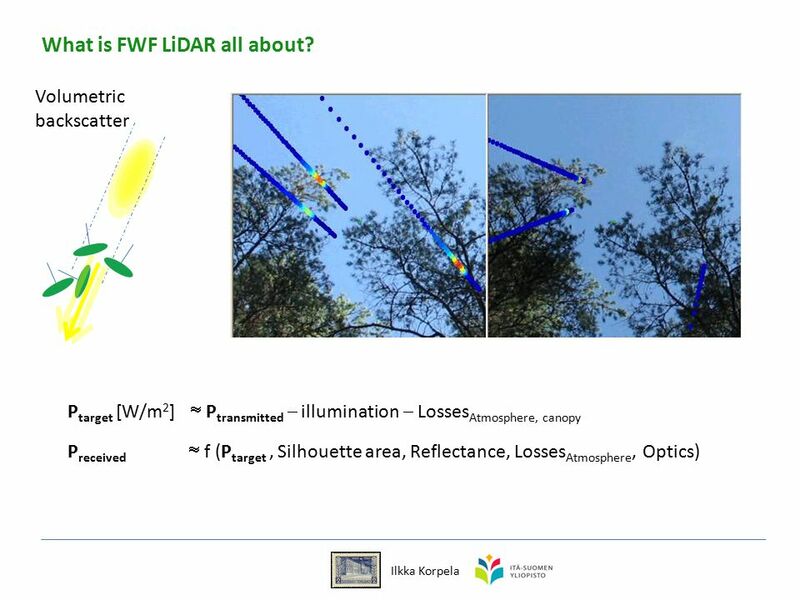 5 Ilkka Korpela P target [W/m 2 ]  P transmitted  illumination  Losses Atmosphere, canopy P received  f (P target, Silhouette area, Reflectance, Losses Atmosphere, Optics) Volumetric backscatter What is FWF LiDAR all about? 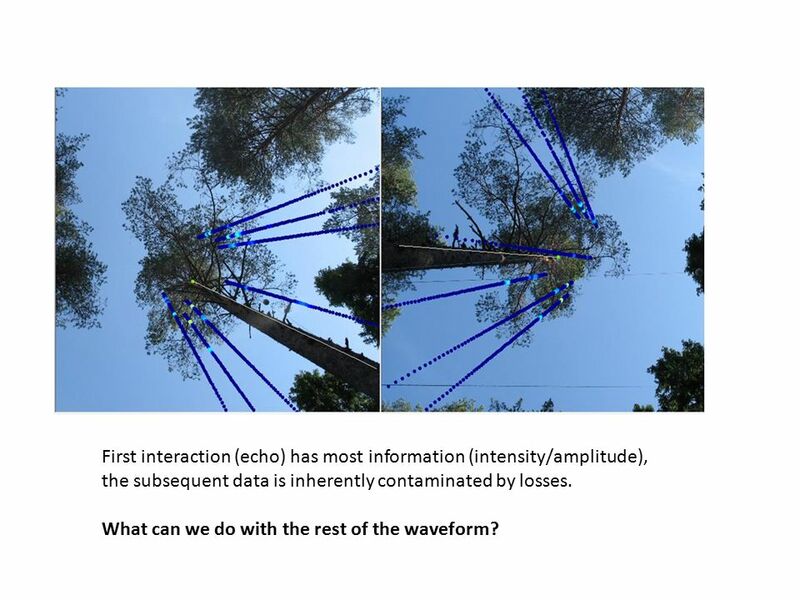 10 First interaction (echo) has most information (intensity/amplitude), the subsequent data is inherently contaminated by losses. What can we do with the rest of the waveform? 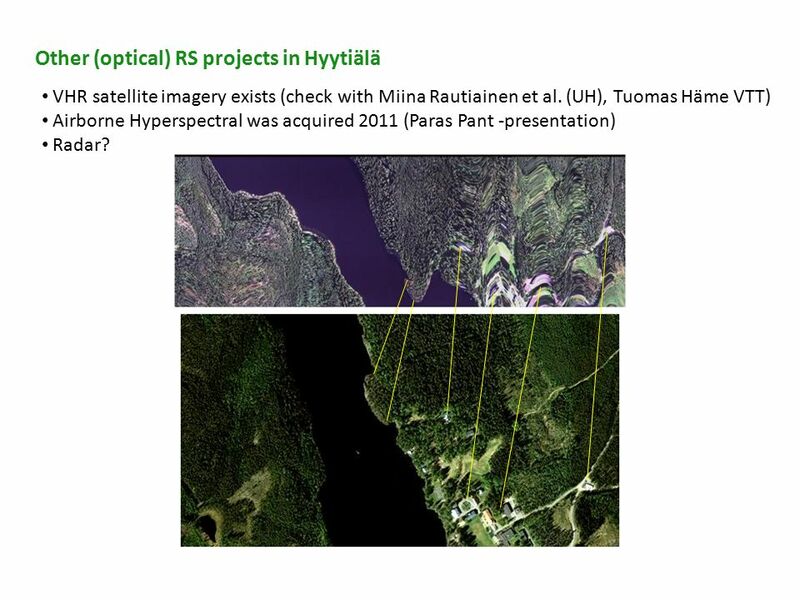 14 Other (optical) RS projects in Hyytiälä VHR satellite imagery exists (check with Miina Rautiainen et al. 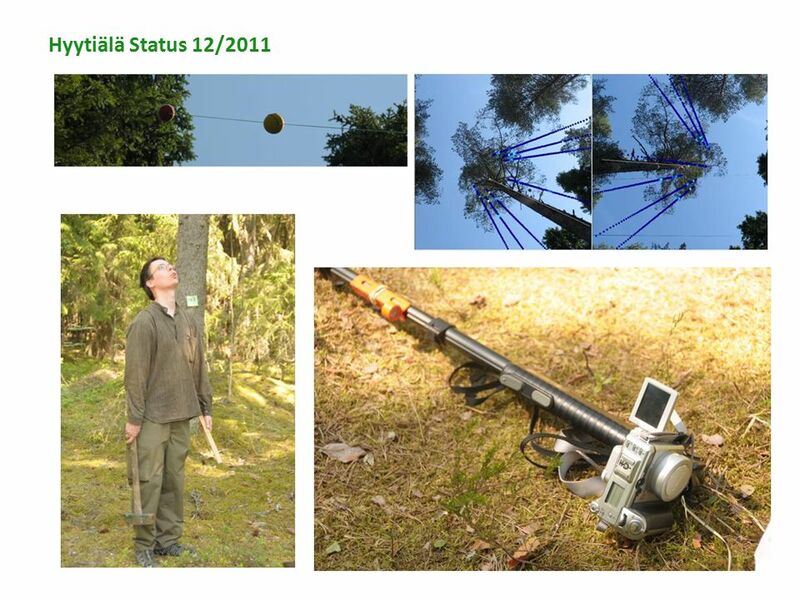 (UH), Tuomas Häme VTT) Airborne Hyperspectral was acquired 2011 (Paras Pant -presentation) Radar? 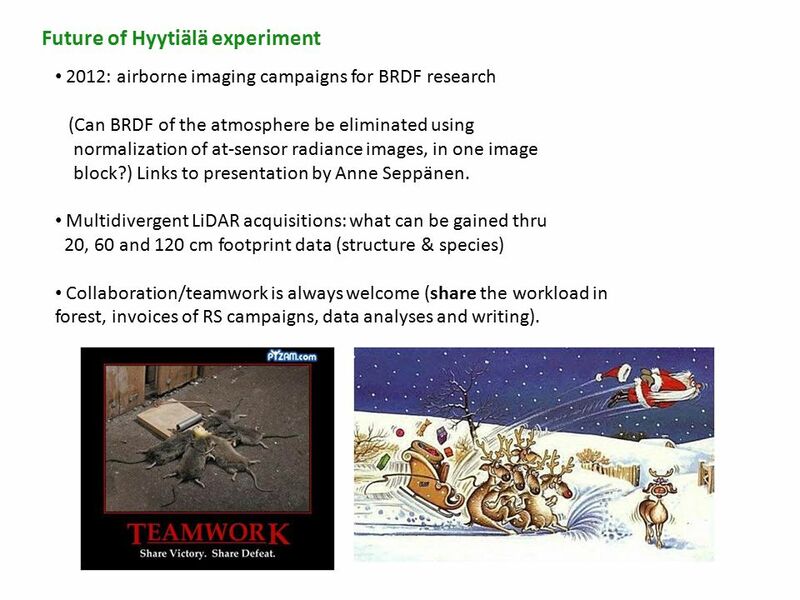 15 Future of Hyytiälä experiment 2012: airborne imaging campaigns for BRDF research (Can BRDF of the atmosphere be eliminated using normalization of at-sensor radiance images, in one image block?) Links to presentation by Anne Seppänen. 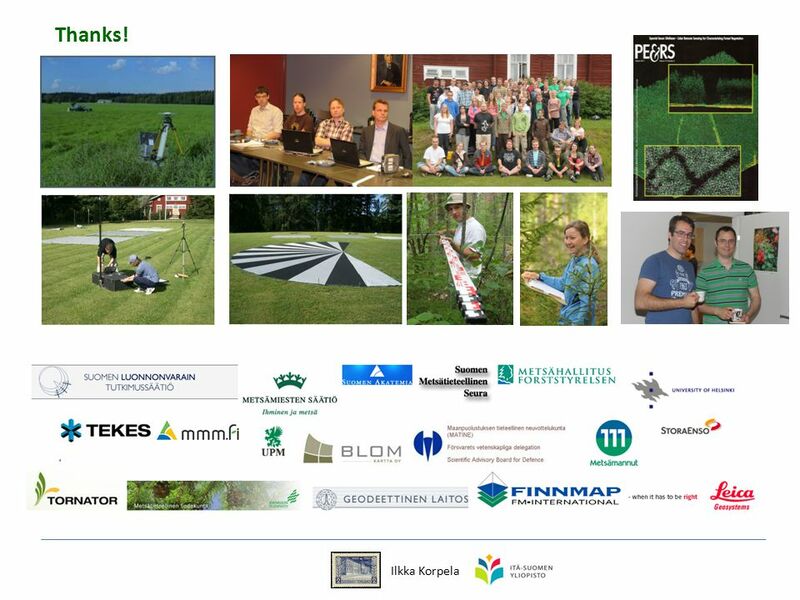 Multidivergent LiDAR acquisitions: what can be gained thru 20, 60 and 120 cm footprint data (structure & species) Collaboration/teamwork is always welcome (share the workload in forest, invoices of RS campaigns, data analyses and writing). 16 Airborne imaging campaigns for BRDF research KRÅNGLIGT Refl. 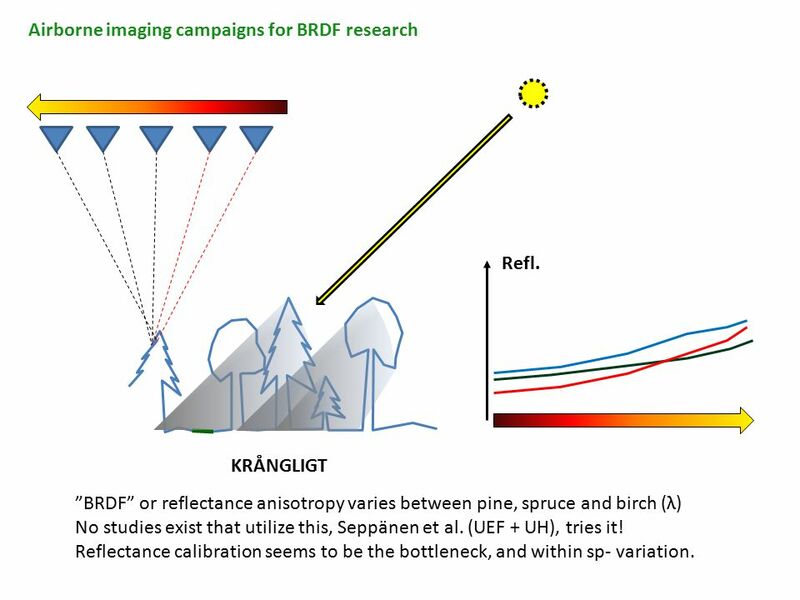 ”BRDF” or reflectance anisotropy varies between pine, spruce and birch (λ) No studies exist that utilize this, Seppänen et al. (UEF + UH), tries it! Reflectance calibration seems to be the bottleneck, and within sp- variation. 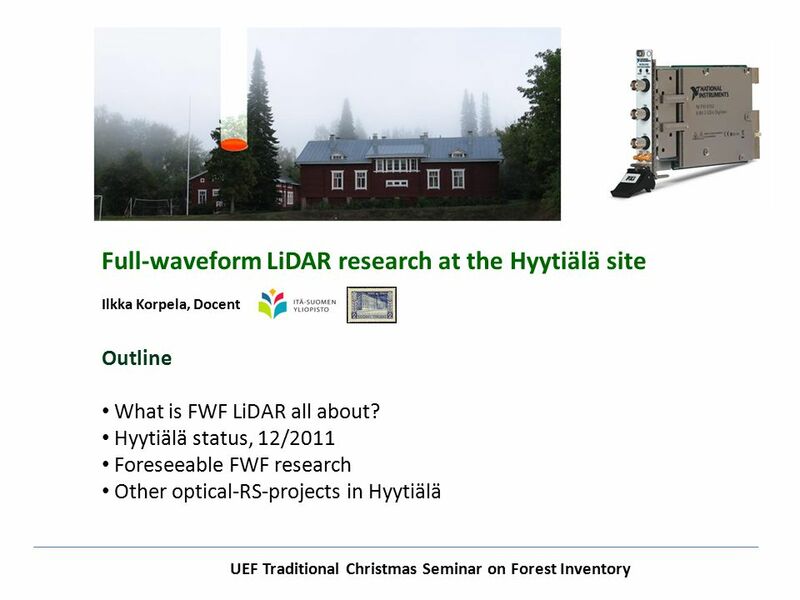 Download ppt "UEF Traditional Christmas Seminar on Forest Inventory Full-waveform LiDAR research at the Hyytiälä site Ilkka Korpela, Docent Outline What is FWF LiDAR." Cloud Radar in Space: CloudSat While TRMM has been a successful precipitation radar, its dBZ minimum detectable signal does not allow views of light. 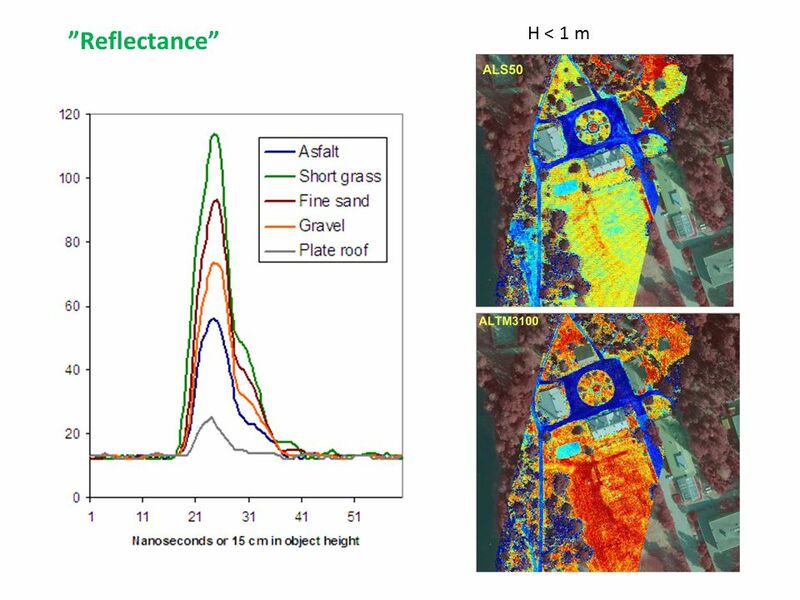 Hyperspectral Image Acquisition and Analysis PECORA 15 Workshop 7 Airborne Remote Sensing: A Fast-track Approach to NEPA Streamlining for Transportation. 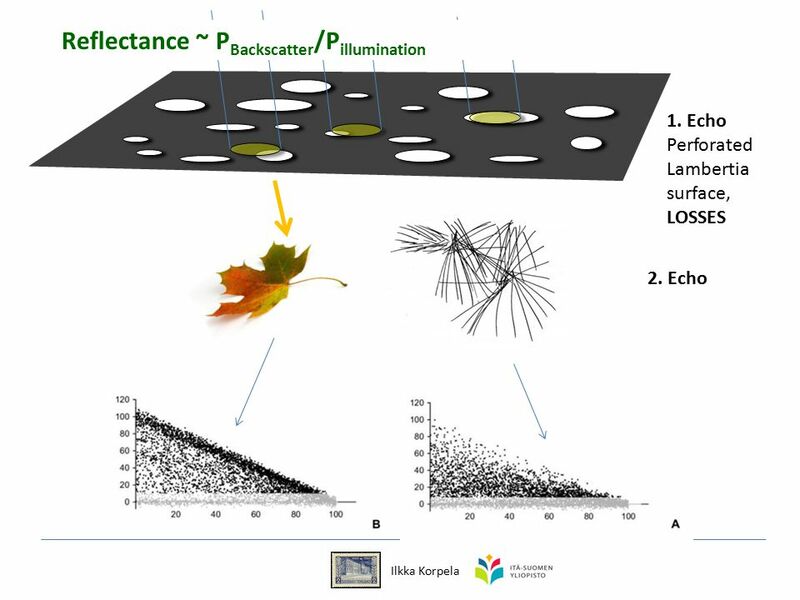 Environmental Remote Sensing GEOG 2021 Spectral information in remote sensing. Oil spill off NW coast of Spain IKONOS image Oil reaching shore. Lecture 12 Content LIDAR 4/15/2017 GEM 3366. Estimating forest structure in wetlands using multitemporal SAR by Philip A. Townsend Neal Simpson ES 5053 Final Project. Radar Mapping. Electromagnetic EM Radiation Electric Field & Magnetic Field –Perpendicular to direction of propagation Explains light but is absolutely. Radar, Lidar and Vegetation Structure. Greg Asner TED Talk. Airborne Laser Scanning: Remote Sensing with LiDAR. Brian S. Keiling Program Head – Forest Management Dabney S.Lancaster Community College. 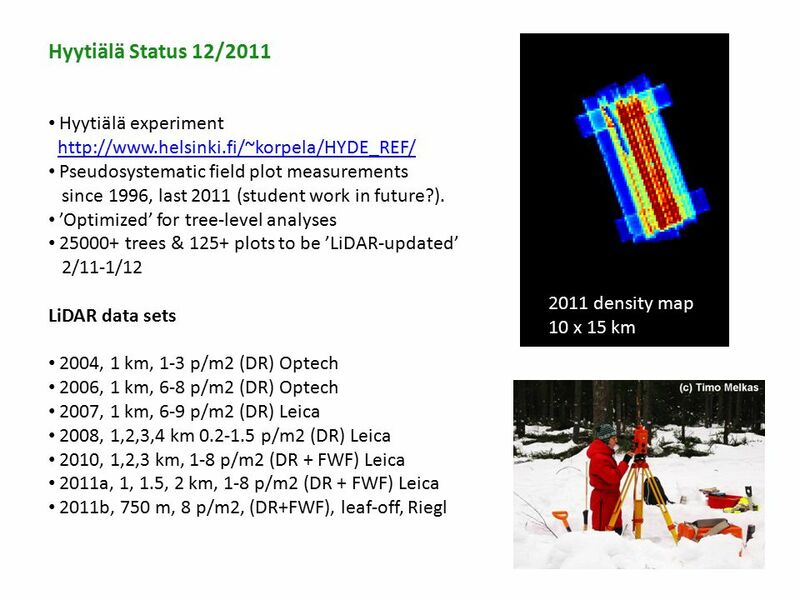 FOR 474: Forest Inventory LiDAR for DEMs The Main Principal Common Methods Limitations Readings: See Website. FOR 474: Forest Inventory Plot Level Metrics from Lidar Heights Other Plot Measures Sources of Error Readings: See Website. 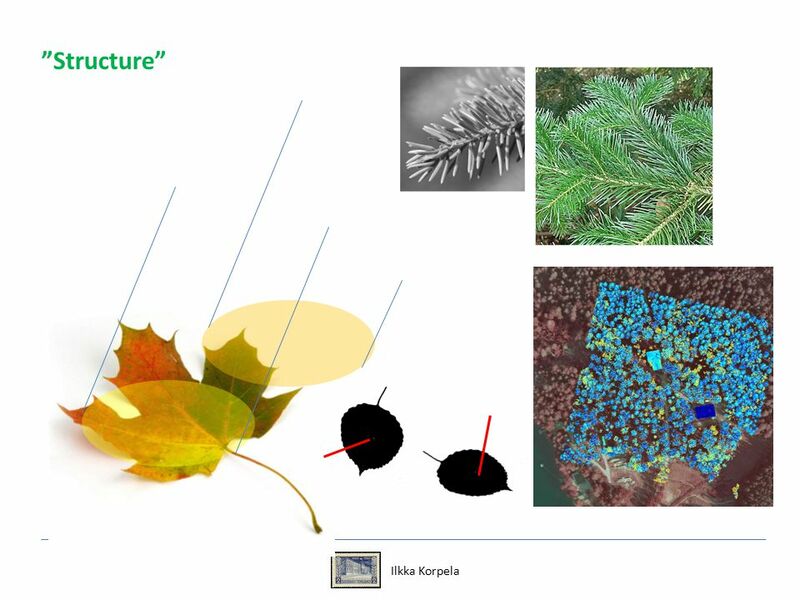 FOR 474: Forest Inventory Introduction to LiDAR What is it? How does it work? LiDAR Jargon and Terms Natural Resource Applications Data Acquisition Standards. Active Microwave and LIDAR. Three models for remote sensing 1. Passive-Reflective: Sensors that rely on EM energy emitted by the sun to illuminate the. Dr. Pinliang Dong Associate Professor Department of Geography University of North Texas USA.